ATR Removals and Storage is based in Bracknell, Berkshire and operates throughout Berkshire, Surrey and Hampshire providing local, National and International removal and storage services. Established for over 28 years ATR is a family run business that prides itself on achieving an exceptional level of customer service for both domestic and commercial clients. Our fully trained staff are experts in handling techniques, hence we are able to offer a full packing service for all of your belongings. Should you prefer to take charge yourself, we can supply you with a whole range of packing materials that will help you pack your belongings safely and easily. For your free, no obligation quotation please call us on 01344 411400. We're here to help. On time, fast, efficient, very friendly. Excellent service. Very reasonable. Did exactly what quoted. Very good. Excellent service, would recommend. Friendly and quick as well as reliable. Removal - empty - transfer - move in. Fast, efficient and friendly - thank you. Excellent service, on time, polite, no damage, would recommend. Very impressed with workmanship. Only comment is it will be good to have an email/text confirming the appointment one day prior to put a stressed home mover at ease. Thanks again. The whole team were very hardworking, efficient, helpful couldn't be better. Packed and moved a four bedroom house to a 3 bedroom duplex apartment. Very helpful and efficient in both packing and the move. Would use again. House from Windsor to Exeter. Fantastic service worked non stop - difficult day but brilliant service. Removal of furniture to new house. Very good service, prompt and very friendly and efficient. Arrived on time. Packed up house quickly and unpacked quickly as well. Would recommend. Was very please with ATR, men all turned up on time, very helpful and the whole move went as planned. They took the strain out of our move. Very professional and friendly helpful staff. Fantastic local company, would use 100% next time. 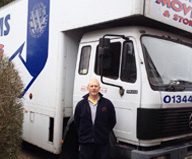 Very friendly and professional staff on the day who helped to take the stress out of the move. Price was very reasonable for the job done. Simply reliable professional service and competitive prices. Excellent, professional and fast job. Tanks guys. Very professional, excellent time keeping and friendly service. Would definitely recommend. Found all personnel friendly and helpful. An excellent , reliable professional service. I would recommend this removal firm to anyone who wants a stress free move. Excellent customer service, very friendly, polite and on time. Quick workers and very competitive price. Moving my house from Berkshire to Surrey. Really easy, quick and very helpful with my move! Have already recommended to a friend! Very competent and I would recommend him. Excellent price and did exactly what I wanted. The company where very very good. I would certainly recommend them. They were fine, everything was good.